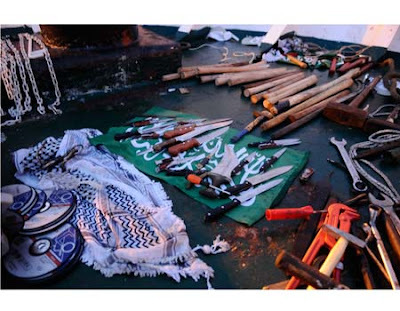 During a search aboard the maritime vessel Mavi Marmara, IDF forces uncovered a cache of weapons including many knives, slingshots, rocks, smoke bombs, metal rods, improvised sharp metal objects, sticks and clubs, 5KG hammers, firebombs and gas masks in case IDF forces fired riot dispersal means at the activists as they violently attacked the soldiers. These weapons were used against Israeli Navy personnel as they attempted to board the ship. 7 soldiers were injured during the incident, which included activists taking two pistols from the soldiers and firing at them. The UN Security Council held an emergency meeting Monday evening, less than 24 hours after the deadly naval raid on a Gaza-bound aid flotilla. During the meeting, Turkish Foreign Minister Ahmet Davutoglu called Israel's actions "murder committed by a state without any justification." "We saw an act of barbarism in live footage and Israel's hands are covered with blood," he added. "The Flotilla organizers not only rejected this offer, but stated clearly that (and I quote) 'this mission is not about delivering Humanitarian supply, but rather about breaking the Israeli siege,' as Greta Berlin, a flotilla spokesperson told the media last week." Many UN ambassadors, including Israel's Gabriela Shalev, were unable to attend the meeting because they were not in New York when it was announced. Carmon continued to say, "What kind of Humanitarian activists demand to bypass the United Nations, the Red Cross, and other internationally recognized agencies? What kind of peace activists use knives, clubs and other weapons to attack soldiers who board a ship in accordance with international law? What kind of Humanitarian activists, some with known terrorist history, embrace Hamas, a terrorist organization that openly shuns a two state solution and calls for Israel destruction, defying conditions set by the international community and the Quartet? The answer is clear: they are not peace activists; they are not messengers of good will. 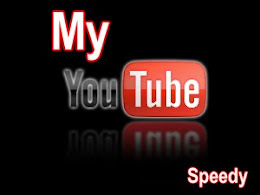 They cynically use a humanitarian platform to send a message of hate and to implement violence." "Let me remind the Council that a state of armed conflict exists between Israel and the Hamas terrorist regime controlling Gaza. Let me remind the Council that rockets and mortars are still being launched by Hamas and others toward southern Israel. Let me remind the council that Gaza is occupied by terrorists that ousted the PA in a violent coup, and that arms are continuously being smuggled, including by sea. Let me stress that a maritime blockade is a legitimate and recognized measure under international law that may be implemented as part of an armed conflict at sea," he added. Carmon said IHH "has a radical anti-Western orientation. Alongside its legitimate humanitarian activities, it supports radical Islamic networks such as Hamas, and at least in the past has even supported global jihad elements, such as al-Qaeda. "Being a so-called humanitarian mission, these champions of human rights also rejected in the initial planning stage an Israeli request to ask Hamas to allow the Red Cross to visit captured soldier Gilad Shalit," he added. The Turkish FM responded to Carmon's claims by saying that the flotilla was carrying supplies "for the children of besieged Gaza, and now these children don't know where their next meal will come from." The Palestinian observer in the UN, Riyad Mansour, told reporters prior to the meeting that he expects a swift response to Israel's actions. "We hope the Security Council will take decisive action…A response that will demand explanations from Israel and condemn (Israel) for this operation. The blockade on the people in Gaza must be lifted."